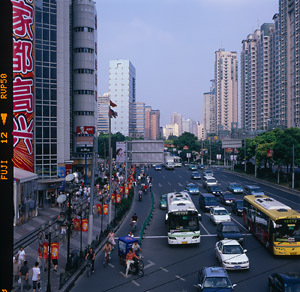 In 2003 Fujifilm introduced Velvia 100F. 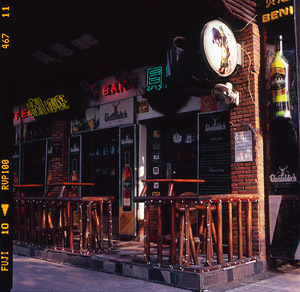 According to Fujifilm's materials, the emulsion "provides the high color saturation that the Velvia name is known for, while retaining color fidelity for assignments that call for color with saturation and accuracy". This "retaining color fidelity" wording went unnoticed at first but it quickly became obvious that Velvia 100F produced duller colour rendition and, as such, was simply a different emulsion that did not replace the original Velvia. 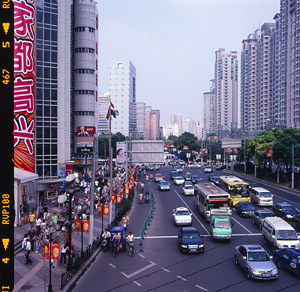 In early 2005 the original Velvia (RVP) was discontinued and Velvia 100 was introduced (note that this is an entirely different film than the Velvia 100F). Fujifilm claimed that it was "an improved product that is truly a worthy successor to the original", as well as that "new Fujichrome Velvia 100 gives photographers the saturation they require with the added advantages of higher speed and finer grain". According to the press release, "The new Fujichrome Velvia 100 is designed to replace the current Velvia 50 product line". The original Velvia was discontinued because vital raw materials used in the production of the emulsion became unavailable. Photographers, however, decried this development and, in response to it, Fujifilm's R&D teams developed substitute raw materials and found new manufacturing technologies that have enabled the restart of production of this famous emulsion. 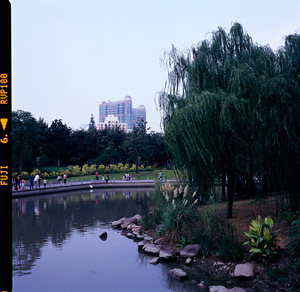 In the spring of 2007 Velvia 50 (RVP50) was introduced and, according to Fujifilm, "the characteristics of the new emulsion will mirror that of the previous product". 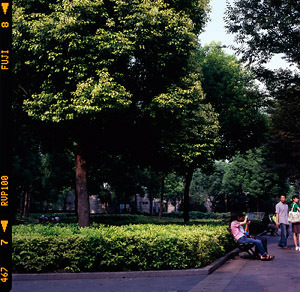 Note that the name of the original Velvia was "Velvia RVP" without the "50" designation; the re–introduced film is called Velvia 50 (RVP50). So as of late 2007, there are two Fujifilm emulsions for those who are after vivid colours and ultra-high saturation—Velvia 50 (RVP50) that "mirrors" characteristics of the original Velvia and Velvia 100 (RVP100) that "is truly a worthy successor to" and "replaces" the original Velvia. This gives the impression that, although there might be some minor differences between the two successors, they still can be used interchangeably, which is what I did at first. One time, however, I happened to photograph the same subject with both films and, looking at the results on the light table later, I could not believe my eyes—the two emulsions looked nowhere close to being descendants of the same venerable film. This called for further testing and comparison. All test pictures were taken with a CFE 2.8/80 lens without any filters, Hasselblad 503CW camera mounted on a sturdy tripod and a cable release. A roll of RVP50 and a roll of RVP100 were loaded in two film backs and every scene was photographed with each of the films within seconds of each other (as fast as I could change the backs and adjust shutter speed). The same settings were used for each pair of test shots with the only exception for shutter speed that was adjusted to compensate for ISO difference. Ambient light was stable. Let us have a look at some basic specifications first. A comprehensive datasheet for Velvia 50 can be found here; a datasheet for Velvia 100 can be found here. RVP100 is faster but slow films come in handy when you need to obtain slower shutter speeds in daylight. RVP100 allows a greater increase in speed (and is one stop faster to begin with). RMS stands for "Root Mean Square" and is a widely used standard for measuring the degree of grain in photographic film. The lower the RMS number, the smaller the apparent grain. Both films are state–of–the–art in this respect. 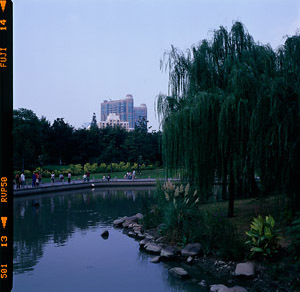 Due to the problems related to reciprocity law failure RVP50 is not a good choice for long time exposures. Both emulsions boast outstanding longevity. Looking at the specifications RVP100 appears an overall better film. To be fair, though, it is only marginally superior and I reckon that in most cases the differences in colour rendition are far more consequential (unless your particular applications put an enormous emphasis on any of the technical characteristics, that is). As far as I am concerned, the only area of concern is that the RVP50 is an inadequate choice for the types of photography that require long exposures. Although I only shot two films and have twelve pairs of pictures to compare, the observations below are consistent with my general impressions that have accumulated after shooting dozens of rolls of both RVP50 and RVP100 in different conditions. Some of the observations are obvious in the scans; others (such as shadow detail rendering) cannot be seen online and you will have to take my word for it. So here is what I see when looking at the slides on my light table. First and foremost, both films boast highly saturated colours that at times even border on surrealism. This is great for landscape and nature photography but, of course, is not suitable for, say, portraiture. Slides shot with RVP 50 look noticeably darker. This creates an impression that the difference in speed between the two films is not one stop, i.e. that RVP50 should probably be rated at ISO40, or that RVP100 should be rated at ISO125, or maybe both. After carefully examining the slides, however, I came to the conclusion that this is not the case. The difference in lightness/darkness is a matter of different rendering and character. More on this below. RVP50 handles highlights in a much more conservative manner. RVP100, in fact, appears to exaggerate highlights and this (at least partly) explains why relative to it RVP50 looks darker. The fact that RVP 100 looks lighter and seems to exaggerate highlights might indicate that it probably should be rated at ISO125. If you look at how the two emulsions render shadow detail, however, you realise that it is not the case—when both films are used at their rated ISO, RVP 50 holds shadow detail slightly better despite producing somewhat overall darker images. One might be tempted to shoot RVP50 at ISO40 so that slides look a bit lighter and one gets better shadow detail. However, looking at real life slides I tend to think that ISO50 is perfectly adequate. As far as colour reproduction is concerned, one immediately notices that, relatively speaking, neutral colours in RVP50 slides have a slight green cast while neutral colours in RVP100 slides exhibit an evident magenta cast. Green colour cast of RVP50 is closer to reality, though. The two films have very different character. On the one hand, I like the magenta cast of RVP100 (great for sunrise and sunset photography); on the other hand, I do not like that it handles highlights in an almost offhand manner and that shadows seem to clog more easily. I would describe the differences between them as follows: RVP50 is conservative, solid and creamy; RVP100 is avant–garde, easygoing and flashy. As with so many things in photography, which one to choose is a matter of particular applications and personal preferences. A word of thanks for putting up your head–to–head comparison of Velvia 50RVP and 100RVP. (...) I've always rated it (RVP50) at 50 so I agree with your observation on its speed. (...) One observation I've had with RVP100 is that sometimes it renders reds way too vivid—like over the top. This aligns right–on with your comment that it is avant–garde and flashy.